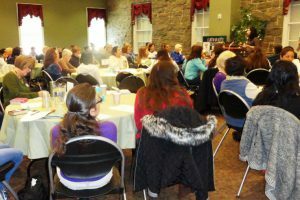 On March 18, 2017, I had the privilege of meeting with a large group from area Mennonite churches at the 6th annual Eastern District and Franconia Conferences’ Women’s Gathering. Every year at this event I think about who will attend, what joys they will have experienced in the last year and what difficulties they may have encountered. I pray for us all that we may meet the Lord in and through each other when we gather. And each year I am again greatly heartened by being among so many sisters in Christ. Once again the hard work of the planning committee and especially our miracle-working God made a way where there seemed to be no way, and we were able to enjoy a sacred day of fellowship, worship, and learning. We had the biggest group ever, with 80 registrants from 15 different churches. 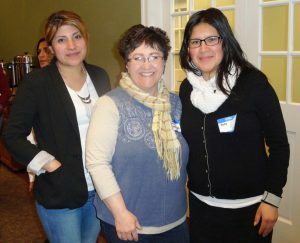 The largest contingent of over 20 women came from Centro de Alabanza de Fildelfia. 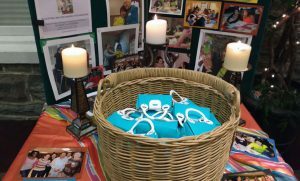 The theme for the gathering was “Carrying Grandmother’s Purse”, a metaphor for the views and messages we often carry from our families and culture that may or may not help us to be the women God created us to be (see the meditation here for more on the metaphor). Our speaker was Pastor Tami Good from Swamp Mennonite Church, who led us in looking at several Biblical women who needed to hear new messages about themselves in order to live abundantly. First they had to shed some of the messages they had heard in the past about themselves, setting aside “Grandmother’s Purse,” as it were before they could accept the messages Christ had for them. We were asked to reflect on three questions throughout the day: Who do they (culture, family, etc.) say that I am? Who do I say that I am? Who does God say that I am? Pastor Tami told about her own journey of letting go of some of Grandmother’s purse as she stepped into God’s calling on her life to be a pastor. Probably the most moving for all of us was hearing stories from those who shared candidly about their struggles and their hopes for the future, and time spent praying in groups of two or more for each other. In the morning we had blue paper purses that we named as our grandmothers’, and in them we placed slips of paper on which we had written things we had heard about ourselves through our lives that we wanted to release. Part of our prayer time was taking those purses up front to a basket where they joined all the others to be discarded. In exchange for these “old” purses, we were given change purses on a keychain in which we had placed positive messages to remember in the future including scripture verses reminding us of God’s messages to us. We were blessed by songs of worship led by women from Centro de Alabanza de Fildelfia, expert translation between Spanish and English by several women, wonderful snacks donated by a dozen registrants, a delicious luncheon prepared by Marta Castillo, and by the faith witness of those who attended. All in all, it was a delightful and very meaningful day. We look forward to gathering together again next year. Much gratitude goes to all who helped make the day possible, including Pastor Mike Clemmer for his generosity in helping to set up and clean up Towamencin Mennonite Church before and after our use of the facility, and the members of the Eastern District and Franconia Conference Sistering Committee who helped plan this year’s event: Pastor Letty Castro (Centro de Alabanza de Fildelfia), Doris Diener, Pastor Tami Good (Swamp Mennonite Church), Pastor Marta Castillo (Nueva Vida Norristown New Life), and Anne Yoder.